According to the IDF, Masshal, who “manufactured, improved and traded different types of ammunition,” was involved in the April 17 rocket attack on Eilat from the Sinai, for which the Mujahideen Shura Council in the Environs of Jerusalem (MSC) had taken responsibility. Following the Eilat attack, Israeli Prime Minister Benjamin Netanyahu had warned that Israel would “exact a price for this [the attack]; this has been our consistent policy for the past four years and it will serve us here as well.” Egypt was reportedly briefed ahead of today’s strike. This afternoon, the MSC released a statement through the Ibn Taymiyyah Media Center confirming that Masshal, also known as Abu Ziad, was a member of their organization. 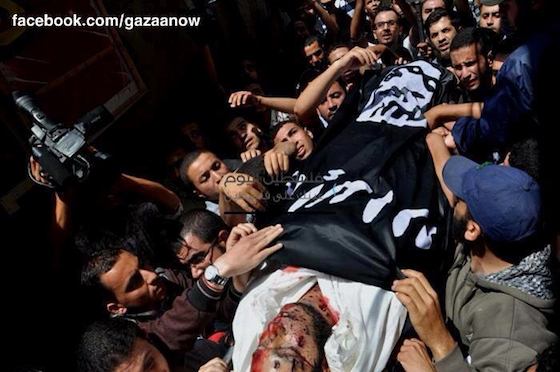 “He stepped everywhere there is jihad, wanting to die, so may Allah have mercy on you, Abu Ziad. The enemy sites will miss you, which you didn’t hesitate for one day to pound with rockets,” the group said. The MSC statement, which was obtained and translated by the SITE Intelligence Group, also said Masshal had held a “high position” in Hamas’ Al Qassam Brigades, but he decided to leave the group after Hamas “entered the game of democracy and accepted the abandonment of the divine Shari’ah.” Masshal, according to the MSC, previously worked alongside a number of Salafi jihadist leaders in the Gaza Strip including Abu al Walid al Maqdisi and Ashraf al Sabah, two MSC leaders killed in an Israeli airstrike in October 2012. The al Qaeda-linked group also noted that Masshal had previously worked with Abu Abdullah al-Suri (Khalid Banat), a former leader in Jund Ansar Allah, who was killed in clashes with Hamas in August 2009. During the funeral, Masshal was wrapped in al Qaeda’s black flag, which was first used by al Qaeda in Iraq but has been adopted by other al Qaeda affiliates. In 2012, the Israeli Air Force targeted a number of members of the MSC. On Oct. 7, the IDF killed Tala’at Halil Muhammad Jarbi, a “global jihad operative,” and Abdullah Muhammad Hassan Maqawai, a member of the MSC. 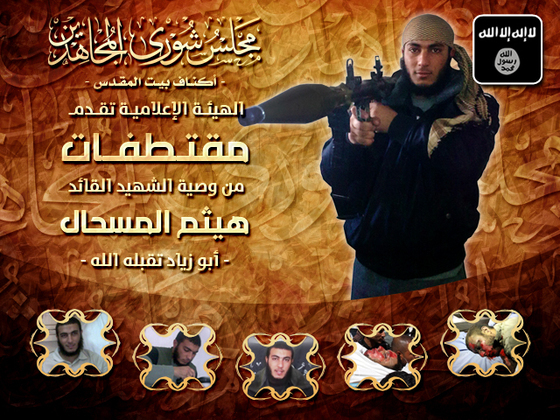 Maqawai was likely a former member of Palestinian Islamic Jihad. Six days later, the IAF targeted and killed Abu al Walid al Maqdisi, the former emir of the Tawhid and Jihad Group in Jerusalem, and Ashraf al Sabah, the former emir of Ansar al Sunnah, in an airstrike. The two men were said to be leaders of the MSC. Following the deaths of al Maqdisi and al Sabah, a number of statements and eulogies were released by jihadist groups and media outlets such as the Global Islamic Media Front, Jaish al Ummah, Masada al Mujahideen, Islamic State of Iraq, al Qaeda in the Arabian Peninsula, Abdullah Azzam Brigades, and Ansar Jerusalem, among others. Important to remember Informant Appreciation Day is coming up soon. So thanks to the over 100,000 sources of information in the Gaza Strip. Remember “Wherever three or more are gathered, one of them works for us”. Seventh paragraph. My, what a slow death. he got his wish to be a martyr and probably learnt by now there are no 72 virgins waiting. Just hell fire.